In the heart of the idyllic village of St Kew near Port Issac, a comfortable converted barn for 4-6 people set within wonderful peaceful gardens with woodland and a stream. Nestled below the village church of St James and a short walk from the renowned St Kew Inn. Ideally located close to Port Isaac, Polzeath, Rock and Padstow. A wonderful private place to retreat to after a day at the beach, sightseeing or walking the coastal path. Please note changeover day is Saturday unless otherwise agreed with the owner. The property has many features including as wooden beams, exposed stone walls, a wood burner and lovely views of the garden and the church. Little Barn is a very warm and welcoming space, comprising an open plan kitchen, dining area and lounge with a new log burner. Downstairs are a bathroom (bath and overhead shower) and two bedrooms: one double and one L-shaped bunk room. Upstairs there is a mezzanine bedroom with double bed set back to provide privacy. The house sits within its own private courtyard garden with access to the stream and woodland area. In spring and summer the garden is full of ferns, magnolias, clematis and roses. The graveled area to the side of the house is a perfect place for drinks and a barbecue. The woodland area and stream are magical and great fun for exploring and den building. The stream will lead you to a lovely ford and footbridge. The garden has lovely views of the XVth century village church and if you are lucky you may hear the bells! The St Kew Inn is a very short walk away , a great pub for a drink and a meal. There is a is ample parking space for 4-5 cars. 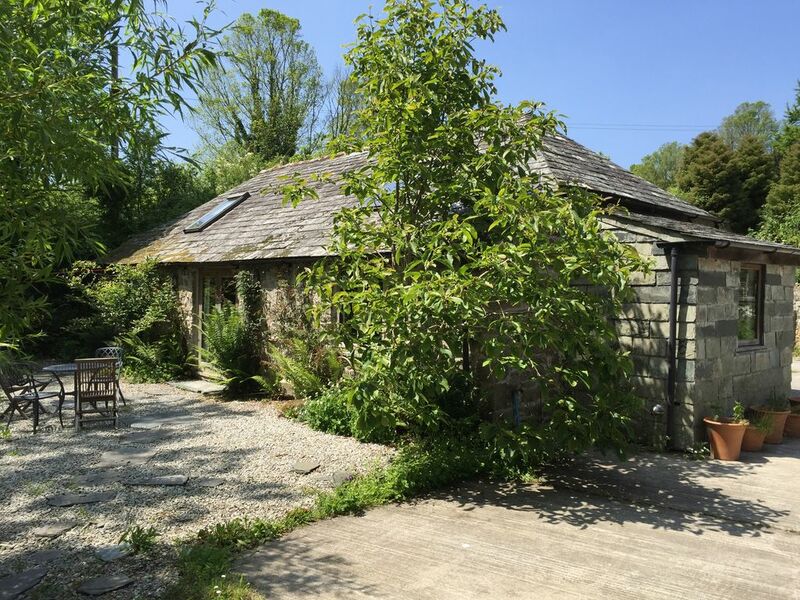 Little Barn can also be rented in conjunction with its sister property Willow Mill (sleeps 8 Property ID 6887309) to accommodate a total of 14 people Property ID 6887322. Willow Mill has been a family home since 1999, we started running it as a holiday let in 2016. The house is characterful and is comfortable and warm. The location in the heart of the village next to the stream, village church and close to the St Kew Inn is magical. Our children love having adventures in the woods, making dens and playing in the stream. It is a great place to unwind after a day at the beach or a long coastal walk. Please bring towels to take to the beach. We had a lovely time at Little Barn which is very close to family who live in the village. The cottage was well equipped for our needs and very comfortable. The weather was very kind to us also (February) and we were able to take the children & dog to the beach most days to make sand castles & fly the kites. We would recommend Little Barn and hope to come stay again. Lovely little barn in great location with all the modern equipment you could need. Less than 15 minutes to Polzeath and other wonderful Cornish beaches and only a 3 minute walk through the churchyard to a super pub - the St Kew Inn. Quiet with plenty of parking plus beach equipment eg body boards and windbreak. Recommended. A super peaceful cottage, very well equipped, clean and comfortable. Just a couple of minor things that would have been helpful - instructions for operating the heated towel rail in the bathroom and full tv operating instructions. The only reason for not awarding five stars is the low ceiling on the mezzanine and lack of clothes hanging space in the main bedroom. Very cozy barn in great environment. Nice barn. Just big enough for our familie (6 persons). We liked the mezzanine as well, but make sure the people who want to sleep 'long' do not sleep there. Very quiet place. The environment and also the St Kew's inn are great! cosy cottage in a good location, relaxing holiday. Maison charmante et bien située. Très bien équipée et aménagée. Nous avons passé un merveilleux séjour. Changeover Day: Tenancies begin on Saturdays at 4:00pm and end on Saturdays at 10:00am unless previously arranged in advance. Please call me to discuss if you wish to start on a different day. For shorter breaks please contact me to discuss your requirements Notes on prices: Short breaks during low season weeks can be booked for a minimum of 4 nights. Please call me to discuss.